Part of Tasmania is covered by a temperate rainforest. Less than 20% of the original rainforest is left, and at the current rate of destruction, what little remains will soon will be lost. 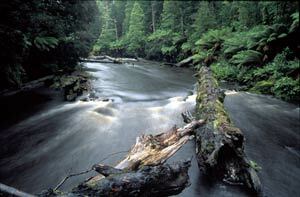 The temperate rainforest in Tasmania is a wet eucalypt forest. Eucalyptus trees, Eucalyptus regnan, 400 years old, tower 70 metres tall. To put this height in context, it is the height of a 25 story building! These trees are some of the tallest trees in the world, exceeded in height only by the Giant Redwoods in California. The Styx Valley is all that remains of the rainforest. The Styx Valley also contains large areas of unlogged tall E. obliqua, E. delegatensis. These forests are home to many native species of wildlife, including the majestic Wedge-tailed Eagle, the Eastern Pygmy Possum, the Yellow-tailed Black Cockatoo, owls and rosellas. Other features that occur in the valley include limestone caves, the high dolerite bluffs of the Snowy Range, the winding, tannin-stained Styx River, and several waterfalls. What is left of the rainforest is being clearfelled for woodchips. What little is left is then burnt. Helicopters fly in and drop napalm, destroying everything that is living. The rainforest is being destroyed at the rate of 300 to 600 hectares a year. The cleared rainforest is then used for plantations. A poison called 1080 is used to kill any living creatures that feed on the saplings. The Styx Valley is old growth forest, pristine forest. The only way to protect it would be to declare the entire area a National Park, a World Heritage site, with a total ban on logging. The only permitted logging would be selective felling on the boundaries. Such logging is sustainable and would yield high value timber products and employ more people than clearcut felling for wood chips. The rate of clear felling in Tasmania has quadrupled in the last decade. Tasmania exports more wood chips than the rest of Australia. Logging company profits have steadily increased. Meanwhile jobs in the industry have steadily declined. Tourism in Tasmania is completely dependent on wilderness. An estimated 22,000 jobs in 2004, at least twice as many jobs as even the puffed-up figures that the logging industry gives not only for the entire logging industry but also secondary industry dependent on logging. Destruction of old-growth forests accounts for less than 400 jobs. Timber Workers for Forests, who log sustainably using high value timber products and with a membership of around 200, estimate at least 650 are employed in this sector, far exceeding the 400 or so employed in destructive old-growth logging. The destruction of the rainforest is being carried out in the name of corporate greed by a company called Gunns Ltd. Protesters have targeted the company EGM (specially called to discuss the issue) and major shareholders. They now also need to target the Japanese customers of Gunns. Mass protest, with 15,000 people taking to the street, forced the rainforest issue up the political agenda. The response from Australian Prime Minister John Howard has been feeble to say the least. But no one should be surprised. This is a government that was one of the major backers of the illegal US/UK war on Iraq, backed the murderous regime in Indonesia and the atrocities it carried out in East Timor, sinks ships of asylum seekers on the high seas, puts asylum seekers who make it to Australia in concentration camps in the middle of the desert, kicked aboriginals off their land to make way for the Olympic Games, refuses to sign the Kyoto agreement on climate change, pushed through draconian clampdowns on civil liberties in the name of anti-terrorism legislation, proposes to vet defence lawyers in terrorist cases. Back in Styx Valley, Global Rescue Station (how to get there) was created, a platform high up in the forest canopy. Proponents justify the destruction by falsely claiming it creates jobs. That it is ok to destroy 400-year-old trees and entire ecosystems because a few trees will remain and thus we do not lose their genetic information. 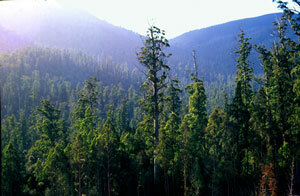 "It is a production area," said Kim Creak, Forestry Tasmania's general manager of operations. "That in itself is a nice tree. But there are hundreds of trees like it... in reserves, in fact, more than required by international standards for preservation of the gene pool." According to Creak, it would be irresponsible to lock up Tasmania's forests and put more pressure on developing countries such as Brazil and Indonesia, where out-of-control logging is devastating tropical rain forests. Tasmania, where the government can regulate logging and replanting, should contribute to the global supply of wood products. Or, in other words, the poor and oppressed of the world, desperate for land to feed themselves, should not be allowed to destroy rainforests, but it is okay if we do it in the name of corporate greed. And we better save a few trees, as you never know, another corporation may wish to patent their genes. More pressure needs to be put on the Australian government. It needs international pressure on the government. E-mail the Australian PM and tell him what you think. Contact the Japanese buyers and tell them what you think. And for more on what you can do, checkout Greenpeace Australia. Also download their letter writing kit. Indigenous native people in Central America put the greedy Aussies to shame. They manage their rainforest sustainably. They harvest berries which are dried and sold for spices, trees are tapped for gum. A very small percentage of the forest is logged and rotated through the forest. The extraction of trees in the small fraction of the forest where logging is taking place is at at the rate of about 1-2 trees per acre. Yes, they could extract far more, could have a consumer lifestyle, but they consider sustainable development, the future of their forest, to be far more important. Puerto Rico earns the bulk of its foreign currency from tourism. Within tourism, the main earner is eco-tourism. In Puerto Rico, forest lodges are built from local materials, the energy is derived from renewal sources. Eco-tourism is more than minimising the impact on the environment, it is also the social and cultural impact. Private eco-lodges are regenerating their own land to form secondary rainforests, creating biological corridors to link together national parks, investing directly in national parks and local schools. The government has calculated a large number of benefits that are derived from rainforests. Taxation is used to help protect the forests. A carbon tax is levied on fossil fuels. This money goes to private landowners to encourage them to regenerate forests. A biological corridor, Mesa Americana Biological Corridor, will eventually stretch from Florida to Panama. Corporate greed knows no bounds. Not content with destroying pristine rainforests, Gunns are threatening legal action against their critics in a crude attempt to silence them. An extremely high risk strategy, obviously they have never heard of the McLibel trial. To fully appreciate the stunning beauty of the Styx Valley and the horror of the destruction, other than actually going there, see the film Tasmania's forests shown at the BeyondTV International film festival 2004 shot and produced by young filmmaker Heidi Douglas for the Wilderness Society.